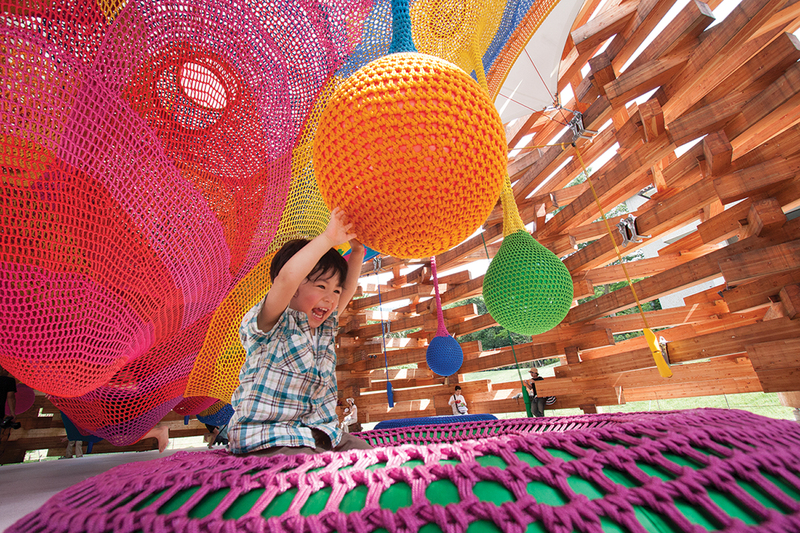 The MacAdams’ vibrant crocheted play structures spread joy – and encourage risk-taking. Published on Friday, July 21, 2017. This article appears in the June/July 2017 issue of American Craft Magazine. 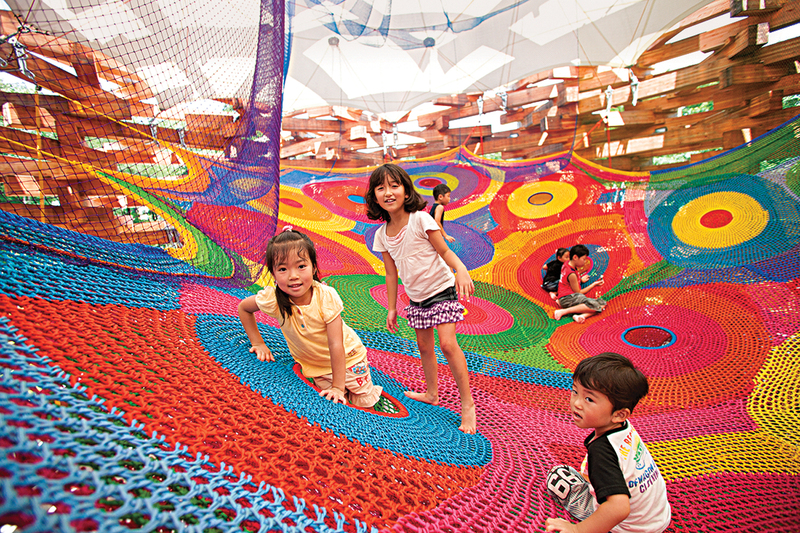 Rainbow Nest, 2000: This structure at the Takino Suzuran Hillside national park in Hokkaido, Japan, is an example of the MacAdams’ AirPocket designs, which provide several levels and portals for kids to explore. Inflated doughnuts and swinging bulbs add to the fun. Click on a video about Rainbow Nest and the first thing you notice is the screaming. Not the terrified kind – it’s the delighted squeals of children playing with complete abandon. 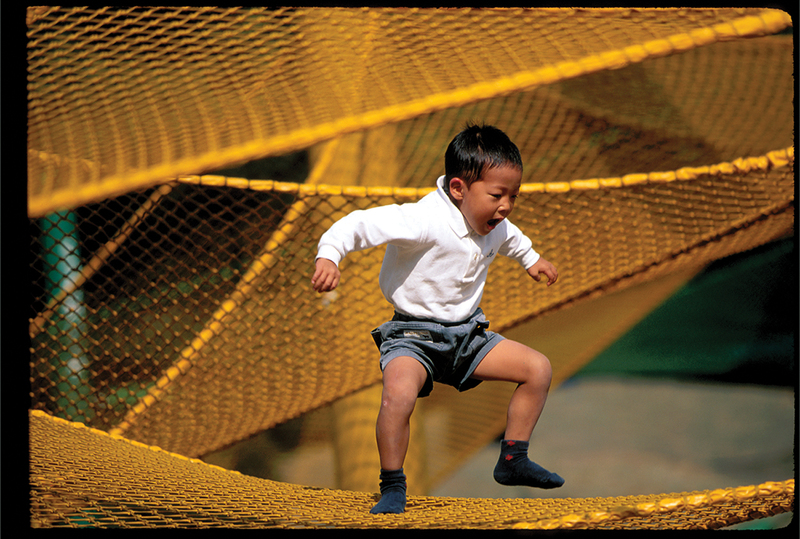 A boy climbs the side of a brightly colored net, grips it, then races back across its length and up the other side before flinging himself wildly into the mesh at its edge. 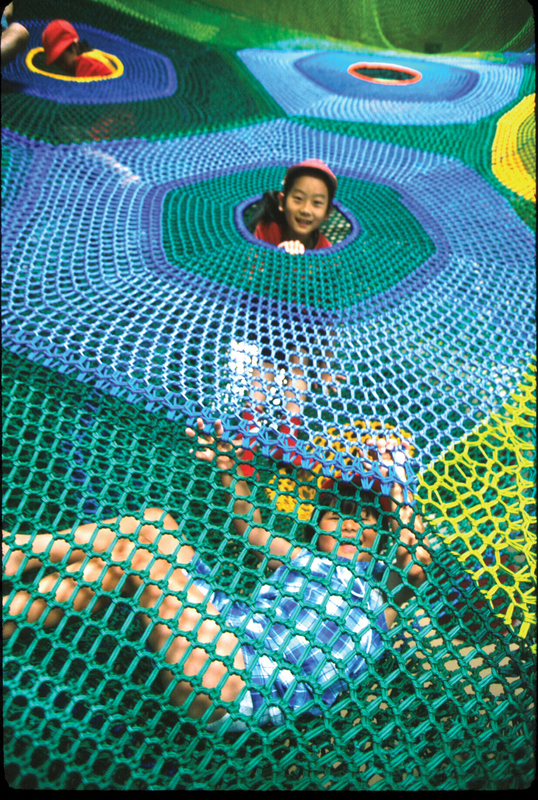 Below, two girls stack tire-shaped foam cushions covered in colorful crocheted fabric and climb into them, before one of them launches herself through a small opening into the net above her. 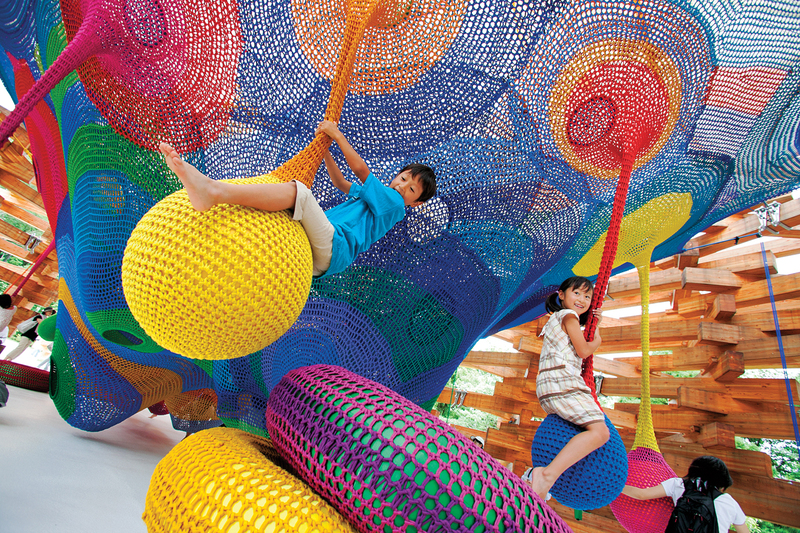 The play structure, installed at Takino Suzuran Hillside national park in Hokkaido, Japan, was designed by textile artist Toshiko Horiuchi MacAdam and her husband, Charles, and assembled from hundreds of pounds of braided nylon cord, all hand-crocheted by Toshiko. 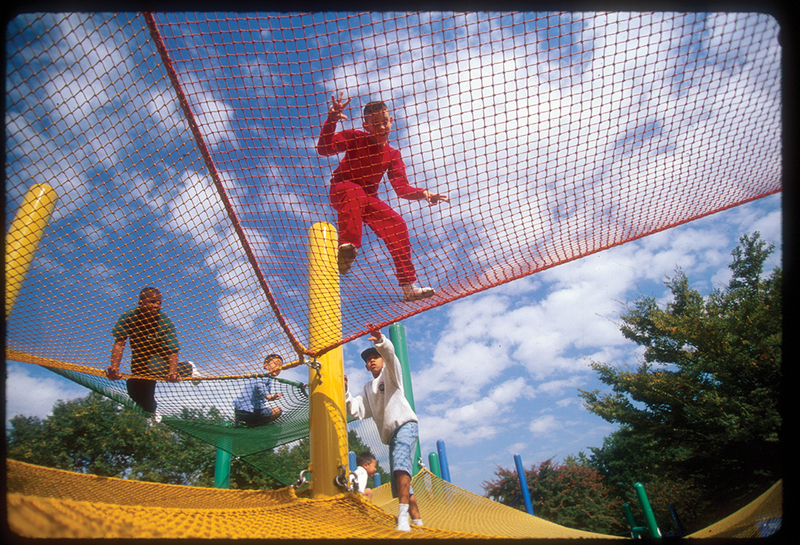 Using up to 2,000 pounds of fabric and stretching as long as 60 feet, their play structures can also be found in New Zealand, China, Italy, Spain, and the US – in parks, schools, and museums, at shopping malls and in housing developments. This year, the couple is working on new pieces to be installed in Dubai and Florida. Though they have spent much of their adult lives in Nova Scotia, the two met in Tokyo in 1982. And that is where Toshiko, whose early sculptural work led to their first crochet play structure, began her path. She was born in wartime Tokyo in 1940, but her parents moved the family to Japanese-occupied Manchuria, where her father opened a hospital for civilians, when she was 3. Toshiko’s early work was marked by a fascination with form and space, and an affinity for organic forms. “If you make a slit in something woven, it’s just a slit,” she says. “But with knitting, tension and the length of the slit create different shapes.” Crochet, she found, is even “freer” than knitting, making it easier for her to work with organic shapes. But at age 30, she became depressed, feeling that “something was missing from my heart.” She had a revelation: “Textiles were produced by humans and developed for their needs. But I had been so intrigued with structures and objects that had nothing to do with people.” Feeling the need to reconnect with the living world, she created a large-scale sculptural installation reminiscent of cells. Rendered in cremona, a synthetic rope produced in Japan, it filled a room in a Tokyo gallery. 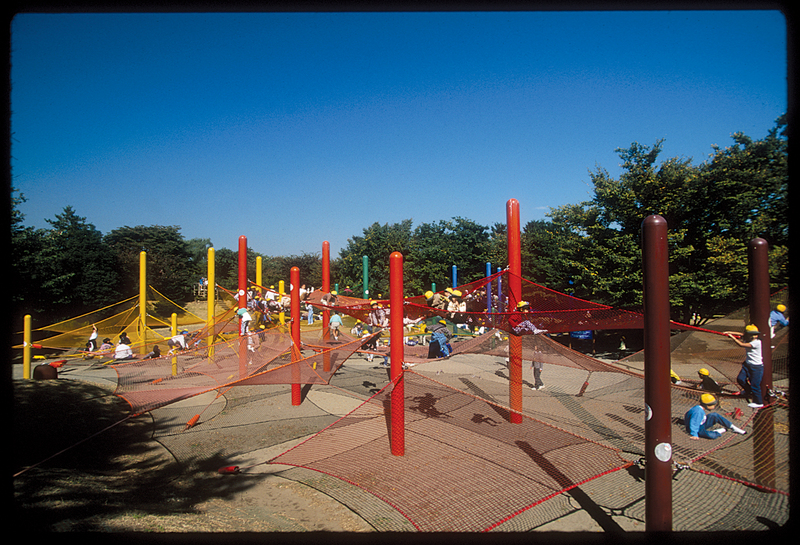 She continued making pieces for exhibition but got the opportunity to build her first large-scale play structure in 1979, when innovative landscape designer Fumiaki Takano, a former student, asked her to create a piece for a national park in Okinawa. It proved immensely popular, and other commissions followed. Meanwhile, Charles, who was born and raised in Nova Scotia, had earned a degree in literature before studying weaving and drawing at NSCAD in Halifax. (Toshiko was teaching a summer course while he was there in 1978, but the two didn’t cross paths). He was working as an investment banker in Japan when he met Toshiko in 1982. They got married, had a child, then moved to Bridgetown in 1988, where, two years later, they started Interplay Design and Manufacturing to focus full-time on creative play structures. Over the years, they have refined their processes and materials, using high-quality nylon, dyeing it themselves, then braiding it into rope in their workshop. (The heaviest gauge of rope is braided for them elsewhere.) Structural engineer Norihide Imagawa is a longtime partner; he tests the load-bearing capacity and integrity of each piece, with software he developed for the purpose. Because of the amount of wear on the structures – some support thousands of children, climbing and bouncing, each day – they require occasional replacement. But with improvements to the production process, that interval has grown. In addition to making new pieces, Toshiko and Charles are in the process of replacing the material on a 60-foot-long structure installed 28 years ago in a Tokyo sculpture park. “At the end, it was worn out and raggedy, but the kids still liked it,” Toshiko says. 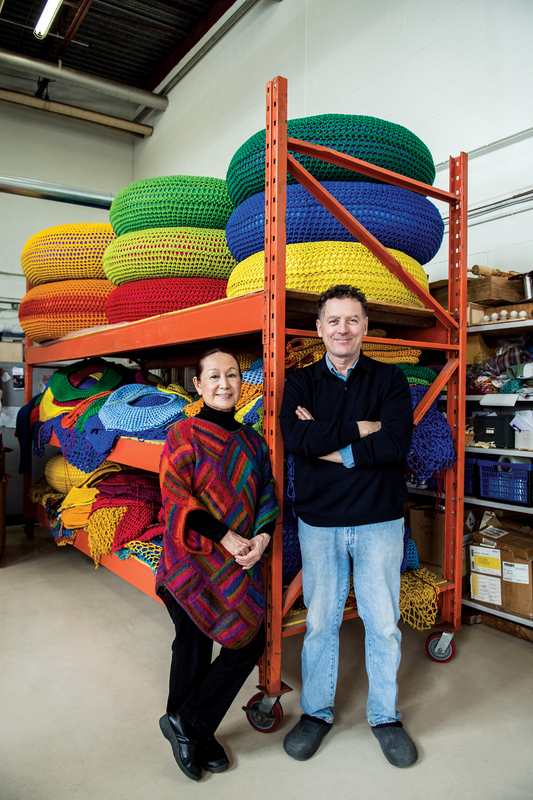 Almost three decades into their collaboration, Charles and Toshiko are busier than ever. That has posed challenges as they get older. 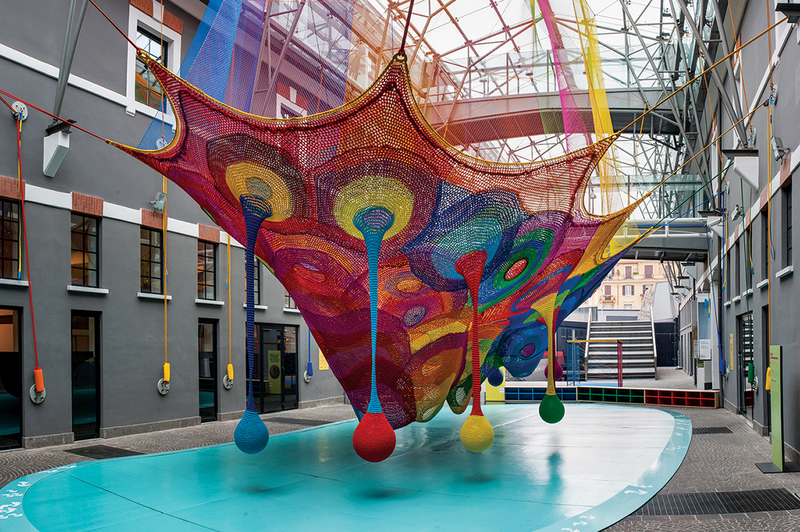 At 64 and 76, respectively, they still create their one-of-a-kind works using two basic types of structures: AirPockets, which are crocheted by hand, and the more web-like SpaceNet pieces, which use machine-knotted nylon. Toshiko often spends eight hours a day crocheting AirPocket structures for installations, with help from Charles, but the duo is developing modular components that can be crocheted by others, reducing her workload. (Finding those others in tiny Bridgetown is another story.) They are also trying to cut down on the amount of time they need to spend on-site for final installation – which ranges from three weeks to a month. The experience helped shape the ethic of spreading joy and living in the moment that permeates her practice. The MacAdams in their Nova Scotia studio. The couple is working on pieces bound for Dubai and Florida. Knitted Wonder Space 2, 2009: The MacAdams partnered with architects to create this partially covered jungle gym in Japan’s Hakone Open Air Museum. 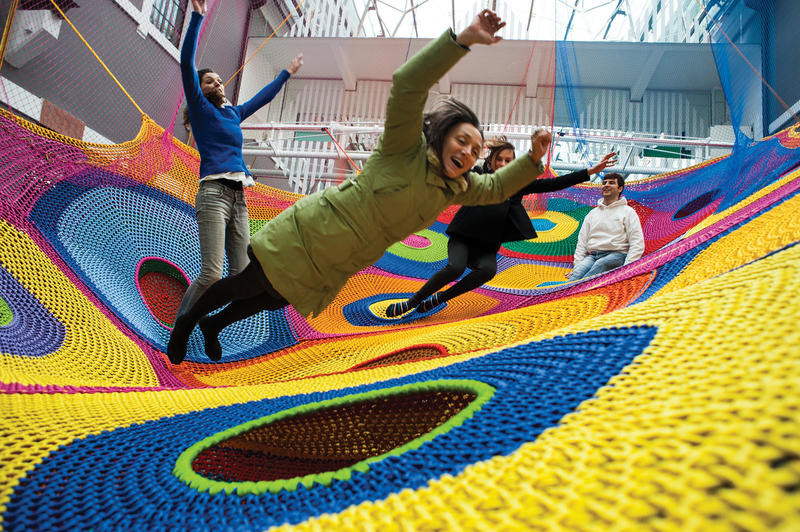 Toshiko Horiuchi MacAdam and husband Charles have been making textile play structures such as this for nearly 30 years. Kids (and adults) can find them at playgrounds, museums, parks, malls, and other public spaces around the world. 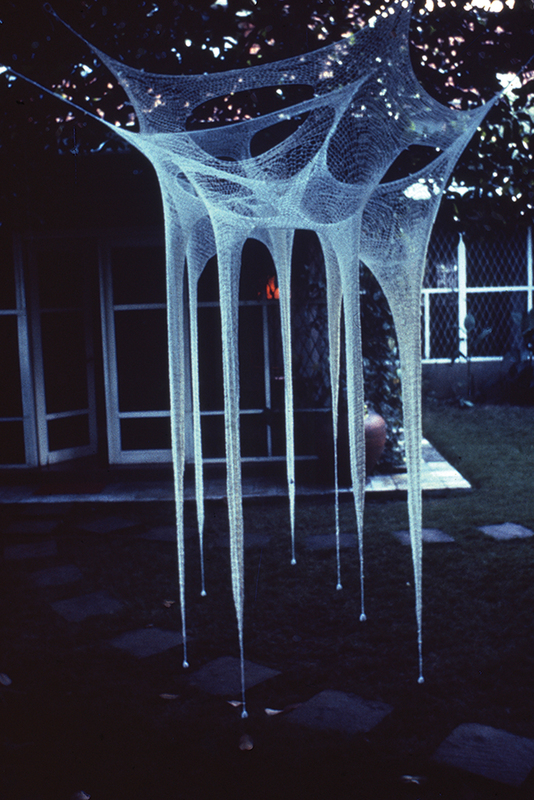 Toshiko’s early crochet installations, such as Hanging 101 (1969), are precursors of the play structures she and Charles create today. 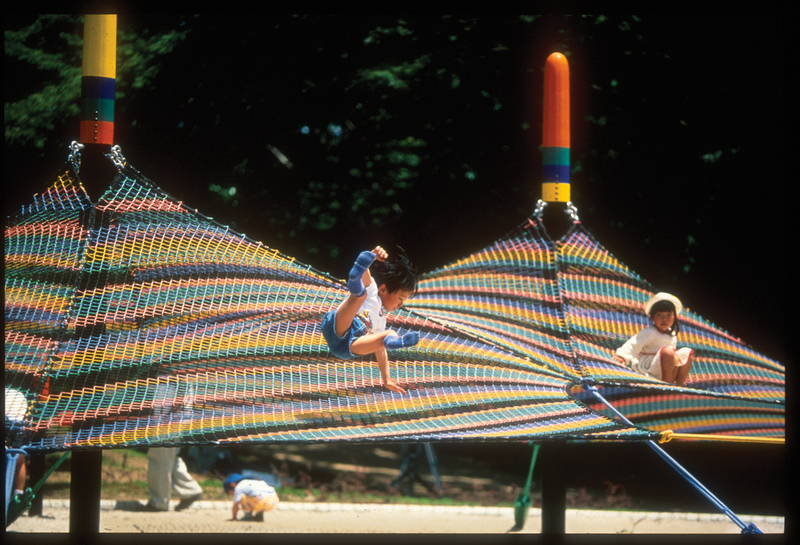 SpaceNet Structures: The MacAdams’ web-like SpaceNet structures, such as Rainbow Hammock (1990), are made with machine-knotted nylon. Over the years, the duo has learned a lot about the structural integrity of different fibers. SpaceNet Structures: The MacAdams’ web-like SpaceNet structures, such as B’Bob I (1995), are made with machine-knotted nylon. Over the years, the duo has learned a lot about the structural integrity of different fibers. 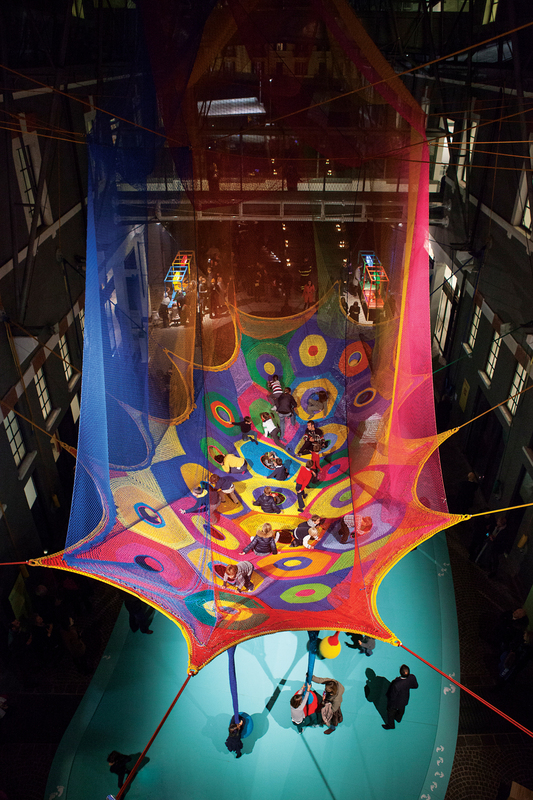 Hung in Italy’s Museo d’Arte Contemporanea Roma in 2013, Harmonic Motion was a draw for kids and adults alike. The MacAdams hire a structural engineer to test the load-bearing capacity of each piece before installing it. 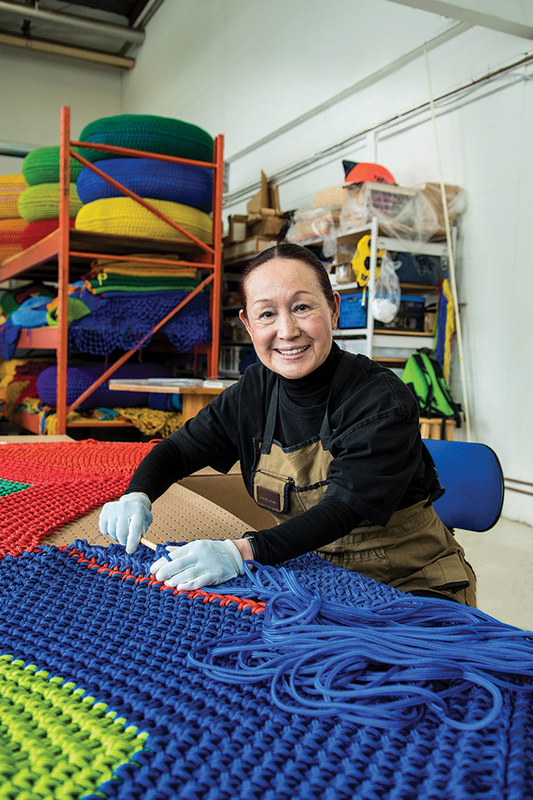 To complete a structure, Toshiko crochets up to eight hours a day with help from Charles. The 76-year-old artist is looking to slow down, however. The couple is developing modular components that can be crocheted by others.